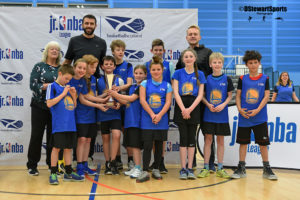 The National Basketball Association (NBA) and basketballscotland are excited to announce the return of the Jr. NBA League for a second year. After the success of last year’s programme which ran in Edinburgh, this year the league will run across the country. The Jr. NBA is an international programme run by the NBA in partnership with National Federations which teaches the fundamentals of basketball through healthy competition, with a focus on developing qualities such as hard work, respect, teamwork and sportsmanship. The programme will see 450 boys and girls from 30 primary schools in Aberdeen, Edinburgh, Glasgow and Inverness take part in the competition. As with the NBA, there will be two Conferences of three Divisions and each school will represent one NBA team. The competition will launch on the 3rd of December where Glasgow City Chambers will play host to the Jr. NBA Draft, as each school is paired to their NBA team and receives their branded jerseys. Weekly competitions will then take place in each city over the next 3 months, culminating in the Final Fours on the 15th of March at the Emirates Arena, in conjunction with a Radisson Red Glasgow Rocks game. The Jr. NBA League gets started on the 3rd of December at Glasgow City Chambers with the Draft. Keep an eye out on basketballscotland’s social media channels to follow the day.